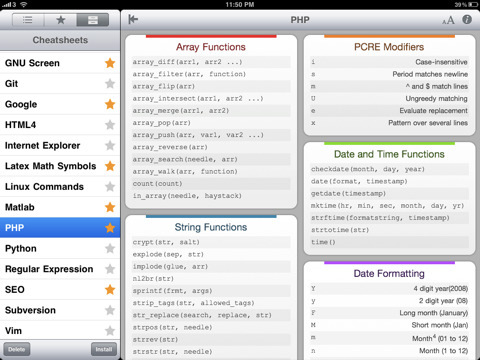 Cheatsheet Viewer for the iPad has got to be one of my favorite little apps for the iPad! As a developer and a frequent user of the computer, there are many applications and tools that I use where I may forget how to do something or can’t remember the command for a specific function. Cheatsheets have long been companions to the computer user as a quick reference to look up what you are trying to remember. There are thousands of cheat sheets available online today as well as in a physical bookstore. Getting a hold of these cheat sheets is one thing, storing and retrieving them in an efficient manner is quite another—enter Cheatsheet Viewer for the iPad. This basic app shows you a list of installed cheat sheets which you simply click and immediately you are shown a nicely formatted, color-coded cheat sheet for that topic. It comes with over a dozen of pre-made cheat sheets of popular tools such as Google searching, jQuery, SEO techniques, VIM, and Git to name a few. You can star any of the sheets to mark it as a favorite and view them in a smaller favorite list view. Cheatsheet Viewer will reformat the screen for portrait and landscape modes as well as allow you to hide the list in landscape mode. Another great aspect of this app is that the developer has provided documentation (online and in a cheat sheet) on how to create your own custom cheat sheets. They are written in XML and are easily constructed following a few simple rules as defined in the “Cheatsheet Viewer” cheat sheet. Once you have created one, you can test it out using an online tool the developer provides. If you are satisfied, you add your new custom cheat sheet by using iTunes file sharing. Cheatsheet Viewer will definitely be an app that I will use on a daily basis. I hope it gains enough traction so that other developers will create new cheat sheets that work with it. AppSafari review of Cheatsheet Viewer was written by Kyle Hayes on October 7th, 2010 and categorized under App Store, Developers, Education, iPad apps, Productivity, Reference, Utilities. Page viewed 5539 times, 1 so far today. Need help on using these apps? Please read the Help Page. Note that this app is ONLY for the iPad, NOT the iPhone. Why this app is even listed on a site that has a byline “Reviews of the best iPhone apps”, not “Reviews of the best iOS apps” beats me. That’s just misleading, appsafari. What’s it doing here? I didn’t check close enough and bought this for the 2 bucks only to wonder why it wouldn’t sync, then it dawned on me. Ah well.